Created in the image and likeness of God from the very beginning of time, human life begins its journey on earth from conception till natural death. We are called to be proper stewards over the gift of life that has been given. This ethic of life is the thread that unites all efforts to uphold the dignity and quality of life at all stages of existence. Let us embrace this teaching with consistency as we continue our efforts in proclaiming the good news of life in our time and place. O Mary, bright dawn of the new world, Mother of the living, to you do we entrust the cause of Life: Look down, O Mother, upon the vast numbers of babies not allowed to be born, of the poor whose lives are made difficult, of men and women who are victums of brutal violence, of the elderly and sick killed by indifference or out of misguided mercy. Grant that all who believe in your Son may proclaim the Gospal of Life with honesty and love to the people of our time. Obtain for them the grace to accept that Gospel as a gift ever new, the joy of celebrating it with gratitude throughout their lives and the courage to bear witness to it resolutely, in order to build, together with all people of good will. the civilization of truth and love, to the praise and glory of God. the creator and lover of life. Recite the following prayer for nine days from December 4 – December 12 (or at a minimum on the first and ninth days of the novena). Pray to Our Lady of Guadalupe (Pope John Paul II, January 25, 1979) O Immaculate Virgin, mother of the true God and mother of the Church! You, who … revealed your clemency and your pity to all those who ask for your protection, hear the prayer that we address to you with filial trust, and present it to your Son Jesus, our sole Redeemer. Mother of Mercy, teacher of hidden and silent sacrifice, to you … we dedicate on this day all our being and all our love. We also dedicate to you our life, our work, our joys, our infirmities, and our sorrows. Grant peace, justice, and prosperity to our people, for we entrust to your care all that we have and all that we are, our Lady and Mother. We wish to be entirely yours and to walk with you along the way of complete faithfulness to Jesus Christ and his Church: hold us always in your loving hand. 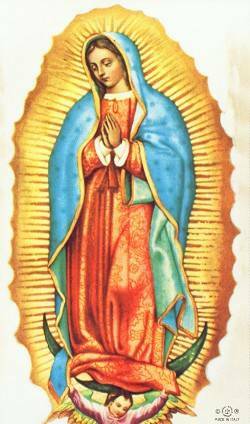 Virgin of Guadalupe, Mother of the Americas, we pray to you for all the bishops, that they may lead the faithful along paths of intense Christian life, of love and humble service of God and souls. … Grant to our homes the grace of loving and respecting life in its beginnings, with the same love with which you conceived in your womb the life of the Son of God. Blessed Virgin Mary, protect our families, so that they may always be united, and bless the upbringing of our children. … Thus, Most Holy Mother, with the peace of God in our conscience, with our hearts free from evil and hatred, we will be able to bring to all true joy and true peace, which come to us from your son, our Lord Jesus Christ, who with God the Father and the Holy Spirit, lives and reigns for ever and ever. Amen. How precious life is, the greatest gift to be given, just for us from our Creator in Heaven. Oh, what joy and love could be in our hearts, if only we trust in our Father above. How thankful I am in spite of the trials, for how could I know joy without knowing sorrow. I'll live for today, for that's now what I have, I'll give thanks for my yesterdays, give him my tomorrow. Each life has a mission, a journey you see, for if he created you then you are meant to be. From the moment of conception till the time you go home, many lives you will touch though many unknown. Scientists, doctor, lawyer, police, homemaker, father, teacher or Priest, no matter how old, no matter how young, we all have a job waiting to be done. There is no life more special than another, we all belong to our Universal Father. Yes, life is precious with its ups and downs and then one day he will call us home. I can only hope that when my day comes, I will hear Him say, that's a job well done. Thank you God for the gift of my life! My Child, the gift I give to you is the Gift of Life. God gave you to me to bring into this world. Now because I love you so, I give you as a gift to another who you will call Mother. My wish for you, my little one, is to soar on Eagle's wings, to stand upon a Mountain, to feel the ocean breeze, to gaze at God's creation, to be all you were created to be. Sometimes it is a mystery how things of life must be, but always trust in God above and know that you are loved. Oh, my Child, I loved you so before I ever knew you. God knows how much I prayed for you to come into my life and how my heart would ache, to kiss and tuck you into bed at night. Now, my little one, you are loved by many, and I thank your Mother every day, for out of her great love for you, I became your Mommy. Remember, we all belong to one great family of our Father above, and each and every one of us will always be loved. Thank you for loving and raising my precious Gift who I entrusted to you. Thank you for blessing me with your Child to love and to treasure. Thank you, Mother, for the Gift of my Life and for giving me my Mommy. Thank you, Mommy, for loving me and teaching me of Life. Thank you, God, for both my Mothers who I will love through all Eternity! Thank you for turning a precious Bud into a Beautiful Blossomed Rose! If you could see inside ~ like a looking glass, So far away, yet Oh, so near If you could see this little miracle, If only you could hear The beating of a little heart, See ten tiny little toes, See the flutter of little eyelids, Hear the cry of a brand new soul. It's a place we all have hidden, Deep within our hearts, This place where God created us, Next to our Mother's Heart. Father God, thank you for giving all of us the breath of life! Help us to value each person, created in love by you. In your mercy, guide and assist our efforts to promote the dignity and value of all human life, born and unborn. Gracious God, we pray that with your grace, we can help to protect, and promote all life and that we will be especially sensitive to the life of the unborn, disabled, and the elderly. We pray, too, that all who make decisions about life in any form will do so with wisdom and love. We pray that you will give our pro-life politicians the courage to stand up for life in the policies and laws that they promote. Thank you for giving us this opportunity to stand up to show our support for life and for our disdain of the practice of abortion. Give peace to the women who will find out today that they are pregnant. Give them the courage to protect the innocent life inside of them and to give it life! We pray a special prayer of protection upon those traveling to Washington, DC, that they will be guided safely there and in their participation in the March for Life. We ask all of these things in the name of your son, Jesus Christ. Amen. Heavenly Father, in Your love for us, protect against the wickedness of the devil, those helpless little ones to whom You have given the gift of life. Touch with pity the hearts of those women pregnant in our world today who are not thinking of motherhood. Help them to see that the child they carry is made in Your image - as well as theirs - made for eterrnal life. Dispel their fear and selfishness and give them true womanly hearts to love their babies and give them birth and all the needed care that a mother alone can give. We ask this through Jesus Christ, Your Son, Our Lord, who lives and reigns with You and the Holy Spirit, one God, forever and ever, Amen. O heavenly Father, strengthen us against the mounting forces of anti-life; enlighten those who walk in this deadly way that they may see the enormity of their sin and return to the generous observance of the divine law. We pray, too, for mothers, that they may prize the great privilege of motherhood; and that they may bring up their children in the holy love and fear of God, thus saving their own immortal souls and furthering the honor and glory of their Maker. Through Christ, our Lord. Amen. Pray for us, St. Gerard, protector of the mother and her unborn child, that we may be worthy of the promises of Christ! Lord and giver of all life, help u s to value each person, created in love by You. In Your mercy, guide and assist our efforts to promote dignity and value of all human life, born and unborn. We ask this through Christ, Our Lord. Amen. Lord God, I thank You today for the gift of my life and for the lives of all my brothers and sisters. I know there is nothing that destroys more life than abortion, yet I rejoice that You have conquered death by the resurrection of Your Son. I am ready to do my part in ending abortion. Today I commit myself never to be silent, never to be passive, never to be forgetful of the unborn. I commit myself to be active in the pro-life movement, and never to stop defending life until all my brothers and sisters are protected, and our nation once again becomes a nation with liberty and justice not just for some, but for all, through Christ our Lord. Amen. Heavenly Father, Thou hast given us the gift of freedom to love and to follow in Thy ways and commands. Some parents choose to abuse this freedom by destroying the gift of life which Thou hast given to their offspring. Please forgive those who destroy human life by aborting their unborn babies. Give these unborn children the opportunity to enjoy Thee for all eternity, if it according to Thy ordinance. Assist me in being one in solidarity with Thy little ones by taking to heart the words of Thy Son, "whatever you did for one of these least brothers of Mine, you did for Me." (Mt. 25:40) Therefore, allow me today, Father, to adopt spiritually an unborn child and to offer my prayers, works, joys and sufferings for that little one, so that child will be able to be born and live for Thy greater honor and glory. We pray this in Jesus' name, in union with the Holy Spirit one God forever and ever. Amen. Jesus, Mary and Joseph, I love Thee very much. I beg Thee to spare the life of the preborn child that I have spiritually adopted who is in danger of abortion. O Father in Heaven. Thou art the Creator of life. Protect all expectant mothers and the babies they carry in their wombs. We pray that those who suffer from the evils of abortion will be open to Thine Infinite mercy and love. We ask for the conversion of all who fail to respect the gift of human life. Heavenly Father, guide our actions to help restore in the hearts of all people the sanctity of human life. Amen. Lord God, our Eternal Father, we come to Thy Throne full of awe and reverence at Thy saving power. Through our Savior Jesus Christ, we beg Thee to help us stop the widespread slaughter of unborn babies in our land. May our love for our innocent brothers and sisters closely resemble the love that exists in the Holy Family. Help us provide all human life with protection under our civil laws. We know that through the intercession of our Mother Mary, chosen Spouse of the Holy Spirit, our request will be granted. Amen. Holy Mother of God and of the Church, our Lady of Guadalupe, you were chosen by the Father for the Son through the Holy Spirit. You are the Woman clothed with the sun who labors to give birth to Christ while Satan, the Red Dragon, waits to voraciously devour your child. So too did Herod seek to destroy your Son, Our Lord and Savior Jesus Christ, and massacred many innocent children in the process. So today does abortion killing many innocent unborn children and exploiting many mothers in its attack upon human life and upon the Church, the Body of Christ. Our Lady of Guadalupe, we turn to you who are the protectress of unborn children and ask that you intercede for us, so that we may more firmly resolve to join you in protecting all human life. Let our prayers be united to your perpetual motherly intercession on behalf of those whose lives are threatened, be they in the womb of their mother, on the bed of infirmity, or in the latter years of their life. May our prayers also be coupled with peaceful action, which witnesses to the goodness and dignity of all human life, so that our firmness of purpose may give courage to those who are fearful and bring light to those who are blinded by sin. Encourage those who will be involved in the March for Life; help them to walk closely with God and to give voice to the cry of the oppressed, in order to remind our nation of its commitment to life, liberty, and the pursuit of happiness for all people. O Virgin Mother of God, present our petitions to your Son and ask Him to bless us with abundant life. Amen. Loving God, I thank you for the gift of life you gave and continue to give to me and to all of us. Merciful God, I ask your pardon and forgiveness for my own failure and the failure of all people to respect and foster all forms of life in our universe. Gracious God, I pray that with your grace, I and all people will reverence, protect, and promote all life and that we will be especially sensitive to the life of the unborn, the abused, neglected, disabled, and the elderly. I pray, too, that all who make decisions about life in any form will do so with wisdom, love, and courage.